BIOSTAR is proud to announce the perfect solution for those looking for the most cost-effective solution for their gaming and crypto mining platforms, both new and old gamers and miners alike. 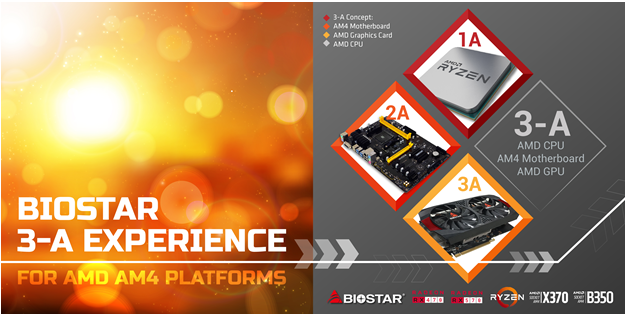 BIOSTAR’s new 3-A Concept utilizies the combined foundation of AMD’s product platform including the AMD RYZEN 7 and AMD RYZEN 5 CPU, together with AMD chipset motherboards and AMD graphics cards. This allows a complete AMD-based ecosystems that are designed to work together in complete harmony to give miners, enthusiasts and gamers the best combination for utmost efficiency and performance. BIOSTAR has an array of new-generation motherboards including the 2nd-gen RACING series motherboards like the BIOSTAR RACING X370GT7 flagship and the RACING X370GT5. Together with theTB350-BTC which is a specialized crypto mining motherboard, there are plenty of options to choose from no matter what application you want: you can choose to game and go for crypto mining with BIOSTAR 3-A concept. BIOSTAR AM4 motherboards are fully compatible with the latest AMD RYZEN processors including RYZEN 7 and RYZEN 5 to fully allow multi-tasking applications, content creation and gaming. The latest AMD RYZEN processors offer great value for both professionals, enthusiasts and content creators thanks to its excellent price-to-performance ratio allowing full multi-threaded applications to take advantage of the new Zen architecture’s performance benefit. BIOSTAR’s 3-A Concept is built into the latest AMD products, not just for gaming but also for crypto mining allowing full flexibility whatever application you feel is the best for you. The best is that it also works for both applications so you don’t have to change systems for any applications. BIOSTAR makes it work.